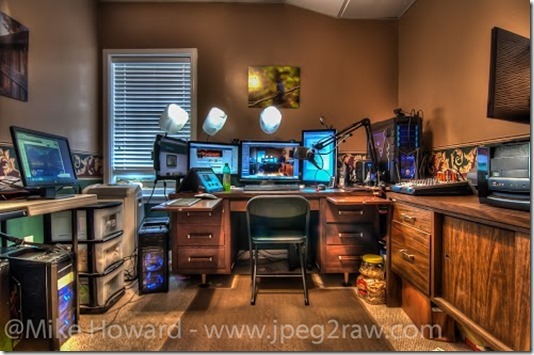 Jim (@jcollison) is joined this week by Mike Howard from jpeg2RAW.com for Show 116. Mike recently spent sometime working on his podcasting studio at home and created what he now calls a Hangoutasaurus for his weekly shows on photography. Using 5 PCs, a mixer and a mic, Mike is able to broadcast and record his podcast in a very unique way. You will be surprised to hear how he did it. Have a listen. Jim was also able to spend time at the Cali Lewis / Drobo meet up in Omaha recently. He recorded several interviews from that event and they have been added to the end of this podcast. I think you will enjoy them. We are at 138 members right now, when we hit 250, everyone in the group gets entered into a drawing for $100 gift card from Amazon for active members. Tell your tech friends to join us there and they could win too! . If you are listening to the audio, here is a pic from Mike’s Studio.